852114 Y-wing Fighter is a Classic Star Wars Key Chain set released in 2007. 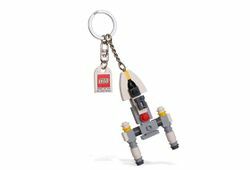 The set includes a miniature model of a Y-wing starfighter attached by the nose to a key chain. Despite the fact that the Y-wing is comprised of several elements, they are glued as one and are as such classified as a single piece. Facts about "852114 Y-wing Fighter"
This page was last edited on 15 March 2016, at 06:15.